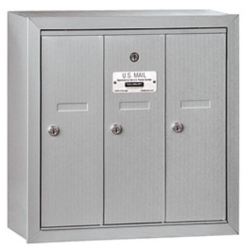 U.S. Mail Supply offers locking indoor and outdoor steel & aluminum mailboxes for residential and commercial properties in Oregon and throughout the United States. 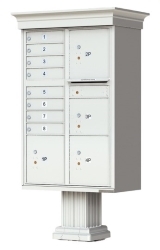 Choose post mounted lockable mailboxes for single unit residences or surface / recess wall mount horizontal and vertical mailbox for indoor environments. Whether you’re after big or small outdoor mailbox units for apartments, condos, town houses or private dormitories, we’ve got a pedestal mount unit perfect for you. 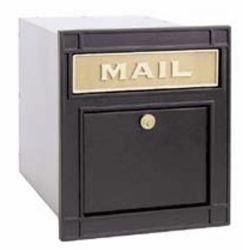 Shop indoor and outdoor commercial mailboxes for business offices, apartment complexes or government or municipal buildings. Choose modern style pedestal mail box units or elegant decorative mail boxes for luxury & high end apartment complexes. 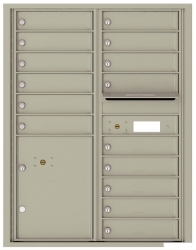 STD-4C horizontal mailboxes are ideal for USPS deliveries, coming pre-approved by the USPS. 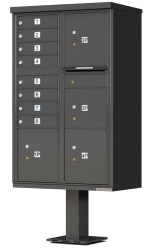 4C pedestal mailboxes are not USPS approved and only appropriate for private use – perfect for university dormitories or other internal mail delivery systems. Getting approved for USPS delivery isn’t always easy. 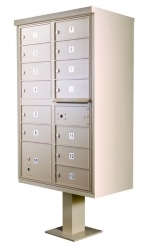 Choose pre USPS approved horizontal, vertical, indoor or outdoor mailboxes for commercial properties. Permanent installation requires compliance with USPS standards. Shop vintage and Victorian style decorative mailbox units or large 4C horizontal indoor mailboxes for a lobby area or walkway. 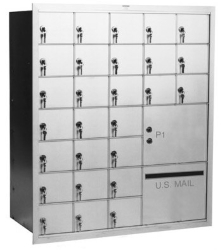 Customize your apartment mailbox with your desired number of slots and optional package drop compartments. Shop outdoor pedestal mailboxes and mail kiosks for commercial properties and residential homes. USPS approved and private delivery options available. Browse the different options for horizontal and vertical indoor mailboxes for USPS delivery or private use. We offer customization options – rear or front loading, number of slots, dimensions, etc. Shop wall mounted metal mail houses or traditional post mounted locking pedestal mailboxes. Heavy- duty metal mailboxes for homes offer a much more durable option than the molded plastic alternatives you find at the local DIY store. U.S. Mail Supply offers mail sorters and literature organizers for offices, mailrooms, classrooms, municipal buildings or shipping departments. 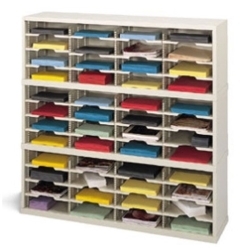 When you need document organization, a heavy-duty mail sorter is just what you need. Our steel & aluminum commercial mailboxes are built to last through heavy use and harsh weather. The last thing you need is to save a few pennies now only to be shopping a couple years from now after your cheap mailbox is worn out. Metal mail sorters offer extra security and diverse locking options to ensure mail, documents and personal belongings are kept secure. Accommodating limited interior space requires deep customization – poring through hundreds of different possible variations individually can be a headache. U.S. Mail Supply offers design assistance so you can submit your own requirements and details and we’ll quote you on the exact mailbox unit you need. If you need any further help choosing the right mailbox for your application, please give us a call at 800-571-0147 and we’ll get you on the right track.